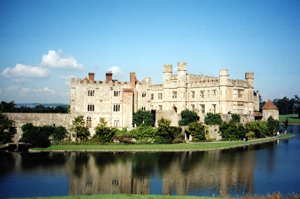 Leeds Castle, near Maidstone, has been described as “the loveliest castle in the world”. Once home to Henry VIII, it stands on two islands in the middle of a lake encircled by 500 acres of green parkland. Built in 857 by the Saxon nobleman Ledian, chief minister to Ethelbert IV, King of Kent it was, for centuries, a royal palace owned by many great names in British history, including William the Conqueror, William Rufus, Edward I, Richard II, Henry IV, and Joan of Navarre. It passed into private hands in 1552 when Sir Anthony St Leger, “a wise and warie gentleman”, was granted Leeds Castle in recognition of his work as Lord Deputy of Ireland where he pursued a conciliatory policy with the Irish, “who, as a result, agreed for the first time to accept the occupation of the English throne as King of Ireland”. Sir Anthony and his descendants occupied the castle until 1618, when Sir Warham St Leger made a disastrous decision to back Sir Walter Raleigh’s ill-fated expedition to discover the legendary gold of El Dorado. Financial ruin followed and he was forced to sell Leeds Castle to a kinsman, Sir Richard Smythe. In later years the Culpeppers and Fairfax families made their home here. After the death of Cornwallis Wykeham-Martin, the owner in 1924, his family were faced with crippling death duties and were forced to sell Leeds Castle. Hearst walked away, but Olive and Arthur Wilson Filmer didn’t and bought the castle in 1926. It had been empty for two years it was in poor condition. Olive, an Anglo-American heiress, spent a considerable amount of her fortune, inherited from her mother, on restoration of the building and grounds, renting nearby Mote Park until Leeds was ready for occupation. But the marriage fell apart and the couple divorced in 1931; Olive retained Leeds Castle and the same year married Sir Adrian William Maxwell Baillie, 6th baronet, thus becoming Lady Baillie. The continuing restoration, decorating and furnishing of her beloved home became her life’s work: she spent more than 30 years improving the castle and grounds. She became famous as a society hostess, holding house parties at the castle most weekends, with many famous visitors ranging from British royalty to film stars. She also had a great affection for exotic birds, having kept some of the earliest known black swans in the country. She was especially fond of Australian finches and parakeets and in 1957 she started to build up an extensive collection of rare and endangered species which, over time, became the most complete and well presented in the UK. In the 1960s “a breeding environment for the waterfowl was created … in an enchanting spot, known as the duckery, between the main entrance to the castle and the wood garden”. Lady Baillie was a heavy smoker and her health deteriorated over the years. She became dependant on oxygen and needed the support of a resident nurse. Upon her death in 1974 a private charitable trust, the Leeds Castle Foundation, was created “to maintain the castle, gardens and parkland for the enjoyment of visitors in perpetuity”.This was financially supported with a substantial endowment from her estate. Lord Aldington, chairman of Leeds Castle Foundation, in a foreword in the April 1988 booklet, The Aviary at Leeds Castle: “Leeds Castle owes so much to the Hon Lady Baillie … not least of the benefits she passed on to later generations of lovers of the castle was her collection of exotic birds … her energy and her enthusiasm inspired her dedicated staff, and with their accumulated knowledge and expertise soon made her collection well known in the world, and especially distinguished for its Australian parakeets and cockatoos, and the rare blue ring-necked parakeet, found only in captivity… we believe that the public greatly enjoy seeing birds displayed in a healthy environment. Susan Remington-Hobbs (née Winn), Lady Baillie’s daughter from her first marriage in 1919 to Charles John Frederick Winn, stayed on at Leeds, living in the Maiden’s Tower and helped to oversee the transition from private ownership, including the opening of the castle to the public in 1976. The ever-growing collection of Lady Baillie’s birds was originally housed in long wooden flights, but in 1988 the 100 species were moved into 48 large rectangular and hexagonal stainless steel aviaries, where they could live in as near natural conditions as possible. As the brochure said at that time: “The birds are not here just to look good; we intend that they should be active, happy and productive.” Princess Alexandra, royal patron of the Leeds Castle Foundation, opened the new aviary, where the flights had been designed by architect Vernon Gibbard, helped by a team of avicultural experts with progressive ideas. It was hoped that, following Lady Baillie’s wishes, the work here would safeguard threatened species by responsible breeding programmes and promote awareness of wildlife conservation so that captive bred young of endangered birds might, with world-wide cooperation, be introduced into their original habitats. Five keepers worked hard observing and evaluating the viability of each breeding pair, checking they had the right mate for every bird displayed and providing suitable nest boxes and natural foliage. This meant building an artificial cliff with plastic pipes inserted, for the Patagonian conures, also known as the bank or burrowing parakeet, which dig burrows in limestone or sandstone rocks in river banks. And a rare breeding success came in 1992 with the hatching of a toco toucan, which they hand reared; in 1995 the pair produced two chicks and brought up both themselves, at that time possibly a first breeding of parent-reared young. They used a grandfather clock-style nest box which was propped up at an angle against a tree. Slightly unorthodox, but the siting had solved the problem of the nervous hen from jumping on her eggs and smashing them with her large feet when planes flew low along a nearby military flight path. The aviary was awarded a certificate of merit by the Avicultural Society for the successful breeding and rearing of young in captivity of Von der Decken’s hornbills., which had chosen to nest in a hollowed-out log high up in the aviary. As in nature, the birds carried mud up to the nest box and the female mixed it with her saliva and applied it around the entrance hole. It set rock hard, incarcerating her inside, leaving just a small slit for her mate to pass food through with his long, narrow beak. In the wild this set-up is created to keep out predators. When the chicks grow and begin to need more food than one parent can provide, the hen will break out, leaving the eldest offspring to rebuild the hole. One year, however, it all went wrong when an inexperienced toucan hen diligently filled up the entrance from the outside. 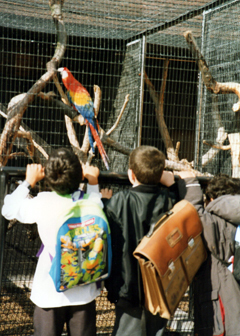 Visitors were constantly entertained by the diversity of tame talking birds. Some of the young parrots and macaws had been hand reared and related to their audience by chattering away. In later years, cameras inside the nests of some of the rarer species enabled visitors to view what was happening out of sight. With expert care and special diets a wide variety of species were bred successfully including from parrots, parakeets and cockatoos to Crowned cranes and red-billed blue magpies, which reared three young in a simple hanging flower basket filled with straw, leaves and grasses. Sadly, by 2012, veterinary bills, animal welfare and regulations took the aviary’s costs to an unacceptable high level. The aviary shut and the birds were rehomed in zoos and aviaries around the country and staff re-employed in other roles. However, water fowl have remained and the castle now has a number of eagles, falcons and owls protected by two wildlife wardens who conduct educational and presentational tours, and a falconry team.